Peel the potatoes, cut into small pieces and cook in steam using the basket for about 20 minutes, until they are soft. While the potatoes are cooking, peel the cabbage and cut it into strips, then scald them in boiling water for a few minutes and drain. Do solder the oil in a large pan, add a generous teaspoon of curry powder to the hot oil (making sure not to smoke), let it give off the aroma then add the chopped onion. 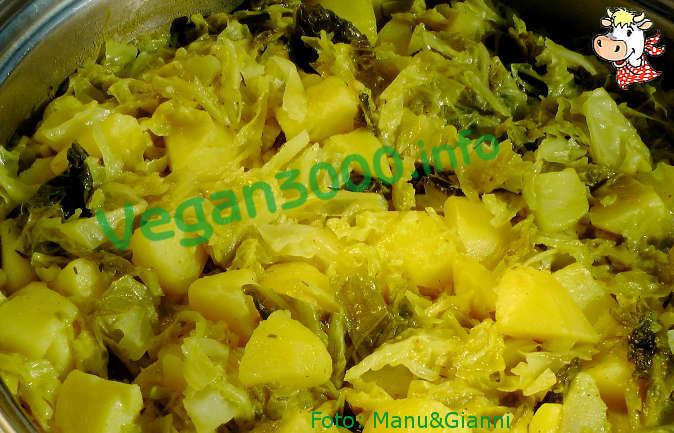 Brown over low heat without letting it burn, then add the cabbage cut into strips, mix well and add the potatoes into small pieces. Pour the soy milk and stir thoroughly. Add salt and cook over medium heat for a few minutes until the milk has been absorbed completely.